← Lobby mourns Japan’s ‘most Jewish Prince’! As the pro-Israel world leaders such as Netanyahu, Francois Hollande, Marine Le Pen, Vladimir Putin, Matteo Renzi, Manuel Valls, Nicolas Sarkozy, Tony Blair, Julia Gillard, etc. have endorsed either Hillary Clinton or Donald Trump as the next US president – the only truth came from Iranian president Dr. Hassan Rouhani. 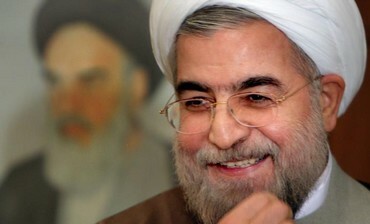 Last week in a televised speech in the city of Ark, Rouhani said he had no preference in the US presidential election and the choice offered to American citizens was between bad and worse. I tends to agree with Rouhani on this as both Hillary and Trump are whores of Zionism. Both candidates insult each other, and expose each other’s criminal past. They have no moral integrity whatsoever. Allan C. Brownfeld, editor Journal of American Council for Judaism also agrees with president Rouhani on this topic. On July 23, 2016, he posted an article, entitled, Clinton or Trump: Choosing the lesser of two evils. In the article, Brownfeld proves that both Hillary and Trump are not only serial liars, crooks, Shylocks, racists, but also warmongers. “Clinton fabricated the story she gave to the families of those killed in Benghazi. While she was secretary of state, the Clinton Foundation solicited millions of dollars from governments who sought favor from Washington,” Brownfeld said. “From Whitewater to her efforts to demonize the women with whom her husband was involved, Clinton’s record does not inspire trust or credibility,” adds Brownfeld. “In Donald Trump we have a candidate whose relationship with the truth seems slight. He claims to have seen thousands of Muslims celebrating on New Jersey rooftops after 9/11, but no one else did. He says he opposed the war in Iraq from the beginning, but he said on the Howard Stern show that he supported it. His character shows in his pattern of insulting others, from mocking a disabled reporter to saying that Sen. John McCain was not a hero because he was captured in Vietnam to suggesting that Sen. Ted Cruz’s father was involved in the assassination of John F. Kennedy,” Brownfeld said. ” Schwartz, who spent a good deal of time with Trump while writing the book, says, “Lying is second nature to him. More than anyone I have ever met, Trump has the ability to convince himself that whatever he is saying at any given movement is true, or sort of true, or ought to be true,” Brownfeld adds.